Let's get this out of the way: I have not tried out Microsoft's new augmented reality HoloLens device yet. That means it's extremely dangerous for me to write this article. There's a chance I come to regret all the words I'm about to write—that in twenty or thirty years some poor child with HoloLens eyes looks up at me from the ashes of the apocalypse and says, "Old man, what's the dumbest article you ever wrote?" And I'll say, "The time I wrote that HoloLens (and augmented reality in general) is not great for gaming." Here's Microsoft's mocked-up version of what the Minecraft demo is like for users. I'm not against augmented reality in general. In fact, I was one of the few people who really wanted to see Google keep working on Glass, not because I thought the original hardware was great but because I wanted to see what twenty years of iteration could accomplish. Some of the demos Microsoft used with HoloLens—rewiring a light switch, working on 3D models—sound great. Others—walking on Mars—sound like they'd be about equally good in augmented reality as virtual reality. Gaming? That's where it breaks. 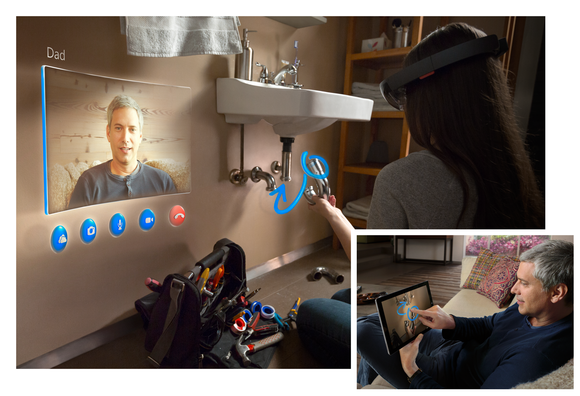 While I haven't used HoloLens yet, I have used two other AR headsets—CastAR and The Cortex—which are presumably close in execution, if not actual hardware and performance, to HoloLens. Every augmented reality game I've played has been generic and lame, once the initial "Holy Expletives!" shock wears off. Why? Because they need to be. It's how augmented reality works. Another "recreation" of that Minecraft demo. In virtual reality, developers create and control the entire environment. It's basically a video game, right? You're constructing a virtual world for someone to inhabit, meaning you can—for instance—tell him or her a story by precisely placing various trigger events, controlling lighting, controlling characters, et cetera. Players navigate this virtual world via some sort of input, but sit or stand in a single place in the physical world. Let's run through a simple scenario. 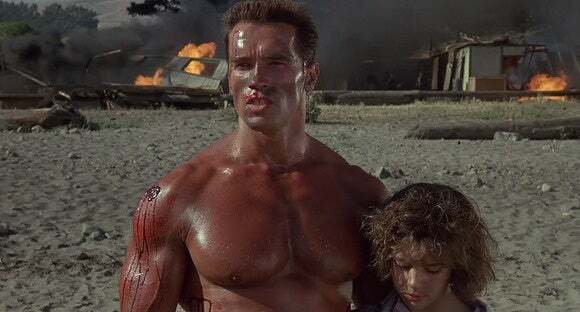 You're a soldier and you have to make it across a paramilitary island base to rescue your daughter from a dude who looks like he's wearing chainmail. (Yes, this scenario is the Commando video game I've always dreamed of.) As a developer, I can not only create this entire island paradise exactly to my specifications but also make sure that, for instance, as you run past this one set of houses it will always explode. Or that there will always be a final confrontation with a boss enemy in a steam room I built, and you know this just as surely as you know that Mario will always encounter a mushroom and a Goomba at the start of World 1-1. This is how story works, even when it's a game that's procedurally generated—like, say, the Oculus Rift demo Dreadhalls. The developers of Dreadhalls don't necessarily know what the layout of each level is, but it's always going to fit into some set of parameters controlled by the creators. Now let's jump back to augmented reality. All that control is gone. Yeah, give me this in virtual reality. Let's transplant our Commando example from earlier into augmented reality. The game boots, and you're suddenly standing on an island paradise. "Amazing!" you shout, pulling the headset off to confirm you're still standing in your living room. You start walking forward, but realize a dense grove of palm trees is blocking your path. In real life, it's your living room wall. No matter. You start infiltrating the island, taking down soldiers left and right. The HoloLens is steering you down "corridors" made up of like, burning tanks or walls of palm trees or conga lines of soldiers or whatever. It needs to make sure you don't run into any real-world walls. And, not knowing when to trigger the "climactic boss battle," it's all kind of left to chance and you end up fighting the big baddie in your broom closet. Well, your broom closet that's cleverly made to look like a boiler room that's two feet deep and three feet wide. Oh well, bad luck. Run the game again, right? Except there are only so many times you can play the same level layout. Your house isn't changing. There are still walls where there were walls last time around. Still a broom closet where there was a broom closet before, except maybe this time the broom closet just has some ammo in it instead of a boss crammed between two boilers. What do you need to do to get a new level? I guess bring HoloLens to a friend's house? Using your normal computer desktop projected onto the walls doesn't need to fundamentally change each time you experience it, the way games do. I know this, because I've done it. I played a "real game" on The Cortex. A shooter, to be exact. Basically, zombies would pop out and try to kill me and I'd have to shoot them before they got close. I played it in a San Francisco hotel room, which was about 11 feet square. At first it was incredibly cool. "Oh yeah, the walls in the game are actually the walls of this room." But it's basically a lightgun game. You can't simulate me walking out the door into another room, because I'm physically stuck in this one hotel room. Everything that's ever going to happen in the game needs to be able to accommodate that restriction, or even be able to work in a 2 ft.-by-2 ft. closet if that's where I happen to be located. That lack of control is the real problem with augmented reality gaming. Nothing else. Talk to people on Skype while walking down the street? Fine. Fix a light switch? The worst that happens is you learn how to rewire a light switch while not actually sitting next to a light switch. But games and stories require control. Otherwise, everything becomes somewhat of a generic humdrum regulated by chance, with no real progression possible. How long can a lightgun game interest you? And I don't mean like House of the Dead. I mean a lightgun game regulated by the furniture you're surrounded by, so you always know there are the same 10-15 spots for enemies to emerge from for the entire time you're playing. Here's another example of a great use of augmented reality: a visual task that doesn't really need to progress or change as you use it. 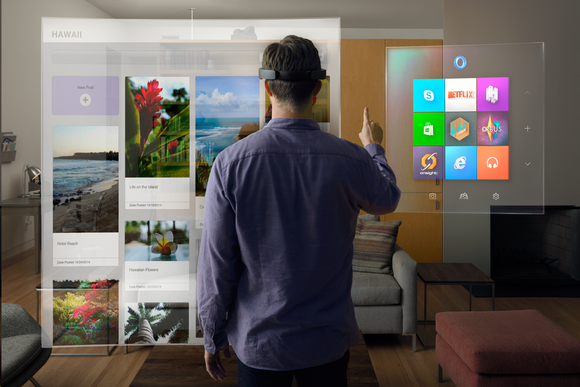 Microsoft's HoloLens demo is very clever so far. But it's clever under a specific set of circumstances. It's like watching the original Kinect demos, and then seeing what we actually got—a product that required a very specific room of a very specific size with specific furniture. Not to mention that Microsoft used Minecraft, a game that is unlike any other game on the market. In its purest form, Minecraft is a virtual Lego set. Lack of control doesn't matter to Minecraft. Build on your coffee table. Build on your stove. Build on your bed. Why should Minecraft care? There's no real story except for what you build. It's a toy box. Similar games—ones that rely on user creativity more than traditional bastions of story, design, et cetera—may work fine in augmented reality. 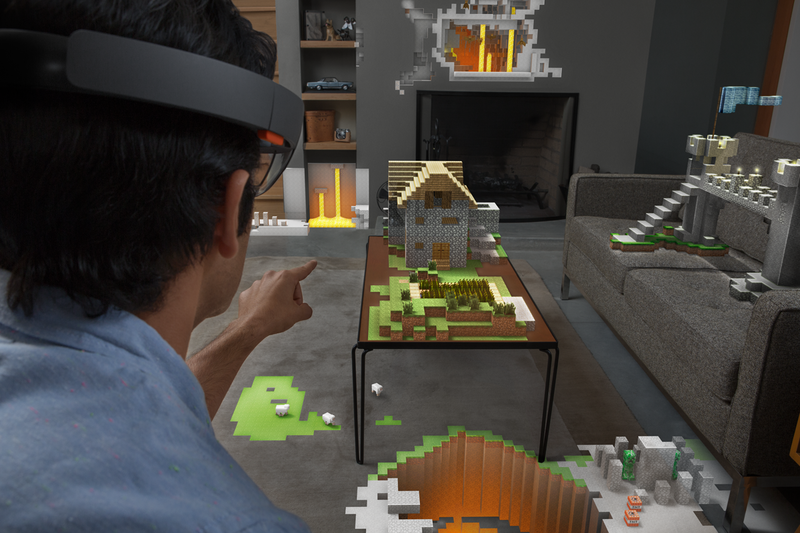 (PCWorld's Mark Hachman certainly enjoyed his time with Minecraft when he tested HoloLens.) But the market can't support too many of those types of games, and HoloLens isn't really an Oculus Rift competitor under those restrictions (at least as far as gaming is concerned). 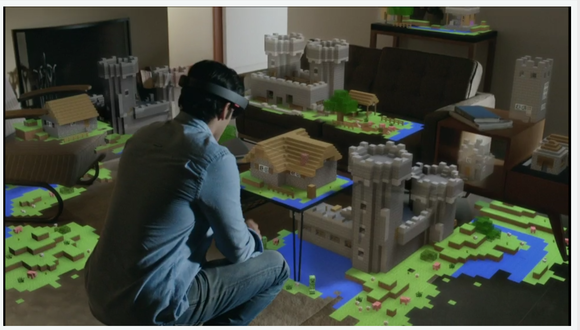 And again, this wouldn't even be a discussion except that Microsoft demoed HoloLens alongside Minecraft and made it a discussion. I don't see people talking about how Google Glass is going to come along and kill Oculus. They're different products, designed for different things, and that's absolutely fine. 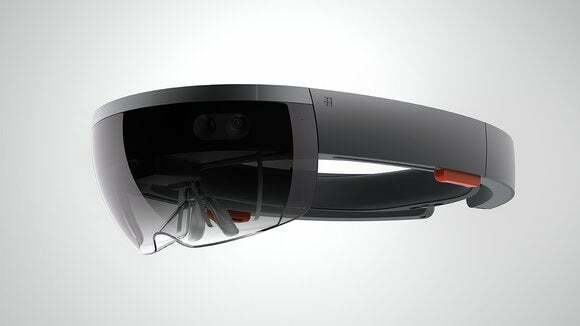 I'm totally pumped for augmented reality. Get more people building PCs by providing tutorial info about which piece goes into which slot, or teach me to play piano better by projecting how I should perform a song straight onto the keys. In many fields, this tech could quite literally change everything. Gaming, though? I'm pretty sure I'll pin my hopes on virtual reality. Now, some enterprising developer go prove me wrong.